Landing page optimization for PPC is the process of creating well-designed pages for PPC visitors and optimizing each element on the page in order to maximize the percentage of visitors that complete your desired goal. The ultimate goal of PPC landing page optimization is to build pages that better engage your target audience so you can drive more leads through paid search. More PPC Leads: When your AdWords landing pages follow best practices, more of your clicks will lead to conversions. That’s what PPC is all about! Better Quality Scores: Targeted, well-designed landing pages achieve better Quality Scores, because they are more aligned with the searcher’s intent. This helps you because higher Quality Scores result in better rankings and lower ad spend. It’s clear that landing page optimization is essential to Search Engine Marketing (SEM), but that doesn’t mean it’s easy. A strong headline that is relevant to your PPC keyword and ad text and compels the visitor to stay with you. Clean, attractive design that looks trustworthy and professional and is consistent with your brand. Concise, convincing copy that communicates the value of what you’re offering. A user-friendly landing page form that doesn’t scare users away. If you drop the ball on any of these elements, you could end up paying for a lot of clicks that never turn into high-quality leads. Unfortunately, optimizing your landing pages can be time-consuming and resource-hungry. To do the job right, you typically need a graphic designer, a developer, and other IT resources, plus a hosting environment. There are so many potential bottlenecks that many AdWords advertisers end up sending PPC traffic to their home page – a huge no-no for conversion rate optimization! But with smart landing page software, you can build and optimize landing pages on your own, quickly and easily, without the help of your IT team. Here’s how. New! Try WordStream's FREE Landing Page Grader Tool. Discover how your current landing page is performing and learn how it can improve. The good news is WordStream takes the guesswork out of landing page generation. Landing Pages & Leads, a robust feature set within WordStream Advisor, includes a Landing Page Builder that guides you through the process of creating and optimizing landing pages for PPC. Best practices are built in, so you’ll know that your landing pages are optimized for PPC success. It’s Complete: You can’t build landing pages in AdWords, forcing you to jump between different applications to complete the PPC puzzle. But WordStream Advisor is a start-to-finish PPC management solution, with all the tools you need to get started in PPC and then cross the conversion finish line. We also provide a ready-to-use hosting environment while still enabling you to publish to your own subdomain. It’s Simple: Landing Pages & Leads empowers you to create, edit and publish effective PPC landing pages, using a step-by-step wizard, without requiring the involvement of your IT team. It’s fast and easy. It’s PPC-Specific: Landing Pages & Leads is designed specifically for PPC. It bakes in best practices for PPC landing page layout and design, so every page you create is optimized for Quality Score and conversions. Let’s now take a look at the steps involved to achieve better landing page optimization. First, define the look and feel of your landing page. Your page’s theme should coordinate with the rest of your website, strengthening your brand. Write the content (headline and body copy) that will appear on your page. The goal of this content is to describe the benefits and/or features of your offering so that your prospect wants to complete your desired action. Some visitors will only read the headline, so be sure to write a strong headline that is clearly relevant to your keyword and ad text. Google looks for relevance between these three elements when determining your landing page Quality Score. For the body, write clear, concise copy that communicates the unique benefits of your offering, so users want to take the next step. The form is one of the most important elements on your landing page. By optimizing your landing page form, you can greatly increase your conversion rates. Choose the fields you want to include and which fields will be required, including standard fields and custom fields. Remember that adding more fields gives you more lead information, but may reduce your conversion rates, as visitors tend to be less inclined to fill out long forms. Try the WordStream Landing Page Optimization Tool FREE Today! WordStream's Landing Page Builder is simple but powerful tool. Use WordStream to create more compelling and better optimized landing pages that will save you time and money, by increasing productivity and generating more sales and leads at a lower cost. Sign up for a free trial. Get Graded: Is Your Landing Page an A or an F? The AdWords Landing Page Performance Grader is packed with valuable info that will aid you in boosting conversion rates and ensuring that your landing pages are set for optimal performance. 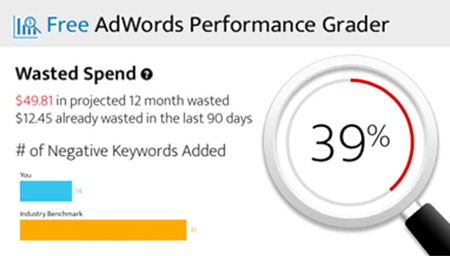 Best of all, the AdWords Landing Page Performance Grader is absolutely free! What have you got to lose? Try it today!